The TC682 is a CMOS charge pump converter that provides an inverted doubled output from a single positive supply. An on-board 12kHz (typical) oscillator provides the clock and only 3 external capacitors are required for full circuit implementation.Low output source impedance (typically 140Ohms), provides output current up to 10mA. 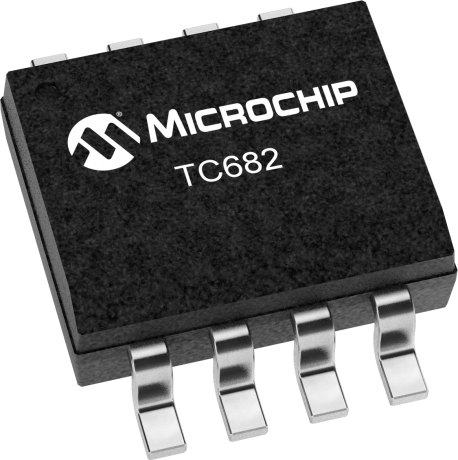 The TC682 features low quiescent current and high efficiency, making it the ideal choice for a wide variety of applications that require a negative voltage derived from a single positive supply (for example: generation of -6V from a 3V lithium cell or -10V generated from a +5V logic supply).The minimum external parts count and small physical size of the TC682 make it useful in many medium-current, dual voltage analog power supplies.